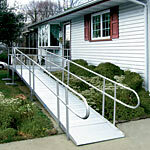 • This ADA-compliant ramp is easily moved or reconfigured. • Has 45° and 90° turns and switchbacks, ADA handrail extension guardrails and gates, while accommodating a rise of up to 60". • All-aluminum construction requires little to no maintenance. Optional handrail designs are available upon request with multiple configurations possible. • Provides support for individuals who hunt or target shoot from a wheelchair. • Mounts easily onto the arms of the wheelchair with hook-and-loop fasteners, allowing ease in release for entry and exit from the chair. • Pad adjusts to either side for target practice and is a comfortable place for the hunter to rest gun, crossbow or arm for a more steady shot. • The 3-wheel scooter features one-hand, Feather-touch disassembly for easy transport. 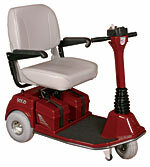 • Standard features include low-profile tires, non-scuffing wheels, backlit battery gauge and wraparound delta tiller. • The 350-lb. weight capacity scooter has a long-lasting, high-intensity LED headlight for optimal pathway illumination. • Lightweight, molded plastic seat with viscoelastic foam inserts for increased comfort and sliders provide a customized seating position. • A hands-free way to carry personal items from place to place while using crutches or other mobility equipment. • Made of lightweight, waterproof nylon mesh material. • Handy for transporting a meal, drinks or other cargo; folds up against chest when not in use. • Chair is designed to offer easy, sturdy assistance to a standing position while enhancing a consumer’s personal mobility. • Built-in rear wheels provide easy portability. • Ergonomic, compact design is suitable for private homes, clinicians’ waiting rooms, dining rooms and more. • Upholstery complies with CA117 regulations, or BS5852 and BS7176. Sang-Chung City, Taipei Hsein, Taiwan R.O.C. 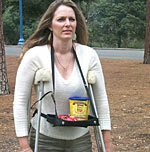 • Combination folding walker and rising aid can be used as a portable toilet safety frame. • Secondary handholds provide stable assistance from a seated to a standing position. 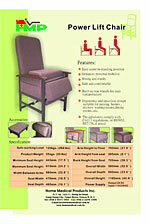 • Height adjustable from 32" to 39" with a simple leg push-button adjustment; features a 400-lb. weight capacity. • Single-release folding mechanism designed to aid users with limited hand dexterity. • Universal design fits standard bathtubs. • Constructed to support consumers up to 375 lbs. • Offers safe and easy transfer to bathtub and out again, without requiring home modification or permanent construction. • Available accessories include chest harness and lap harness with pommel for improved positioning; and swivel slide to facilitate transfers. • Features all-steel construction and a protective finish, along with an industrial-rated 12-volt motor and battery pack and easy-to-use controls. • Fits a wide variety of popular vehicles, including SUVs, with a 31" opening height; retains the second row of seats. Installation takes less than an hour with little to no vehicle modification. Custom installation kits are available. • Offers a three-year, transferable warranty and has a 350-lb. lifting capacity. 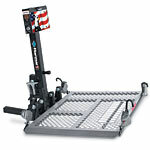 Features a one-piece, fully-assembled drive-on/drive-off platform with adjustable wheel chocks on platform surface. • Custom vehicle false floors are available through special order on select vehicles. • Designed to be easy to operate and built to last for years of trouble-free use. • Universal outside mobility lift has no cumbersome attachments or extra equipment to store. 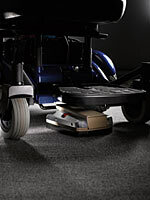 • Features easy power chair automatic tensioners designed for public transportation. • Installs on class 1 hitch (90-lb. maximum scooter/wheelchair weight) or class 2 hitch (140-lb. maximum scooter/wheelchair weight). • Lifts and locks at the touch of a button. • Lightweight, strap-free way to lift and carry a scooter or wheelchair on the outside of a motor vehicle. • Fully-powered automotive seat rotates, then automatically reclines to provide head clearance through the door frame, before lowering outside the vehicle to desired heights. • Can be used in several Toyota and Lexus models, including select Hybrids. • Available in a variety of upholstery options, including leather. • Enables power wheelchair users to easily retrieve backpacks. • Design requires minimum side clearance during deployment. • Has an aesthetic and streamlined appearance. • Can be mounted on the left or right side of the chair. • Designed for all ages, shapes and sizes. • Provides a more comfortable fit than typical slings, resulting in quicker and more complete healing. • Intended for anyone with a shoulder-related injury. • Available in different fabric patterns/colors to suit different consumer styles. • Includes built-in cell phone pocket. • Comes with an unconditional 10-year warranty. • Unlimited length because of unique link design, which can be used to create ramps to fit various applications, environments and accessibility needs. 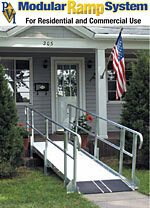 • Always remains a portable ramp; sections can be removed for use as a portable ramp, then attached back on when needed. • Available in 3- and 4-wheel versions in three colors (blue, red, hunter green). • Disassembles quickly for transport; heaviest piece weighs 43 lbs. • 450-lb. 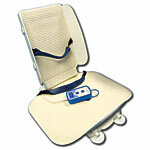 weight capacity to meet the mobility needs of bariatric clients. • Colors are impregnated in the plastic with a finish to protect the color from fading due to exposure. • New designs include 6" top-slit scooter covers for docking arm-style lifts. • Covers available to fit scooters from mini/travel size to full size. • Available in lightweight or heavy-duty material. • Covers for seats and tillers protect against inclement weather while allowing rider to operate scooter. • Powerful and stylish mid-size scooter features captain's seat, multi-function display, 110A Rhino controller and folding armrest and seat back. • Adjustable seat (forward and backward) with adjustable headrest height and tiller angle facilitate easy transfers and a comfortable ride for consumers. • High-performance scooters now available with 450-lb. (Fusion 4.5) and 500-lb. (Fusion 5) weight capacities. • 5-wheel scooters are designed to provide small turning radius for nimble maneuverability indoors; Fusion 4.5 has a 33.75" turning radius. • Built to perform outdoors: Fusion 4.5 features 10° and 5° to 8° RESNA incline stability/safety rating. • Also available:?Fusion 250 and Fusion 350 models. • Designed to easily attach to existing residential doors to enable independent entering and exiting for people unable to reach or maneuver a standard door knob. • Low-voltage system uses a plug-in transformer. • Special activation devices are available for users with limited hand function. • Includes a battery backup, so system can continue to work during power outages. 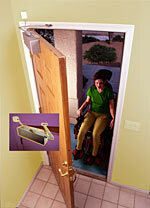 • Door can be opened via a remote control, which can be attached to a wheelchair, or manually. • System can unlatch a locked door, open the door, pause it, then close the door automatically. • Can be used to open doors in light commercial applications, such as offices, storefronts, public restrooms, schools or classrooms, etc. 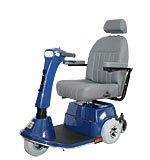 • Facilitates wheelchair docking and minimizes wheelchair movement for greater protection and comfort. • Compact, height-adjustable dock module provides smooth entry and stability. • Low-profile wheelchair bracket offers maximum ground clearance. • With electrical or manual release. • Wider (19" side to side) toilet seat is rated up to 1,200 lbs. to support bariatric users. • Larger seat size is easier for users to grip during transfers. • Under-seat synthetic rubber bumpers grip porcelain to prevent seat from shifting. 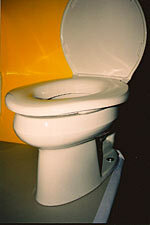 • Fits standard toilets; is 2" higher than standard toilet height. • Offers a solid, seamless design for scooters, wheelchairs or walkers. • No assembly or folding required. • An applied skid-resistant surface and a self-adjusting bottom transition plate allow easy conversion from ramp to ground. • Aircraft-grade aluminum ramp has a 600-lb. weight capacity. • New insert design allows ramp handrails to be connected easily without rivets or set screws and with no tools required. • Interlocking handrails can be installed by one person. • New universal platform design allows for virtually any ramp configuration to be built.